Reasons for high smoking prevalence in Europe compared to Australia and North America are low prices of tobacco adjusted for purchasing power and poor smoke-free legislation and enforcement in Central and Eastern Europe. High rates of passive smoking in Czechia, Slovakia, Poland and Austria are associated with weak implementation of smoke-free public rooms, especially in the hospitality industry. In 2018 Austria cancelled the smoking ban in all bars and restaurants and continued to allow access to minors, while Hungary since 2012 showed remarkable success by limiting supply of cigarettes and by banning access of minors to tobacco shops. Even more advanced are Western European countries because of lower affordability of cigarettes, ban of smoking rooms and tobacco advertising, plain packaging and public information campaigns. Smoking cessation services across Europe make use of quitlines, provide internet counseling and apps for self-help. 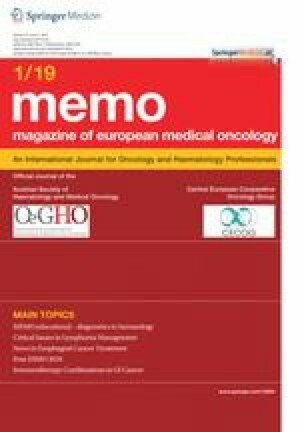 Cooperation with physicians should be improved and could help oncologists to combine cancer screening with smoking cessation. Cancer therapy is more successful after smoking cessation. Smoking prevalence in Australian adults (≥18 years) went down from 28% (1990) to 15% (2017) and in adolescents (15–17 years) to 3% [1, 2] by legislative and fiscal measures listed in Table 1. Similar success in tobacco control was seen in North America. In the United States cigarette smoking prevalence in adults (≥18 years) declined from 28% (1990) to 14% (2017) and the use of any tobacco product (including e‑cigarettes, heated tobacco and oral tobacco) to 19%. In the age group 18–24 years cigarette use went down to 10% and of any tobacco product to 18% . Newly industrializing countries like Brazil or India also succeeded in reducing their smoking prevalence, and in many developing countries smoking rates among women are still low. In China only 3% of women are smokers, but most of these passive smokers and their lung cancer risk is determined by second-hand smoke (SHS) and other indoor pollution (cooking, heating, occupational) and ambient air pollution (fine particles from traffic, coal power plants and other industrial polluters). In China there is an urgent need for smoking cessation among men (68% smokers) and of smoking prevention for women, including passive smoking . Worldwide the smoking epidemic has not yet reached full maturity in women  and also in several European countries smoking prevalence in females is still on the rise. Fig. 1 shows the daily smoking prevalence in percent of the population aged ≥15 years, according to the Organisation for Economic Co-operation and Development (OECD) . The bars show the smoking rates for 2015 and the figures below the rates for 2017 or latest available in European countries . 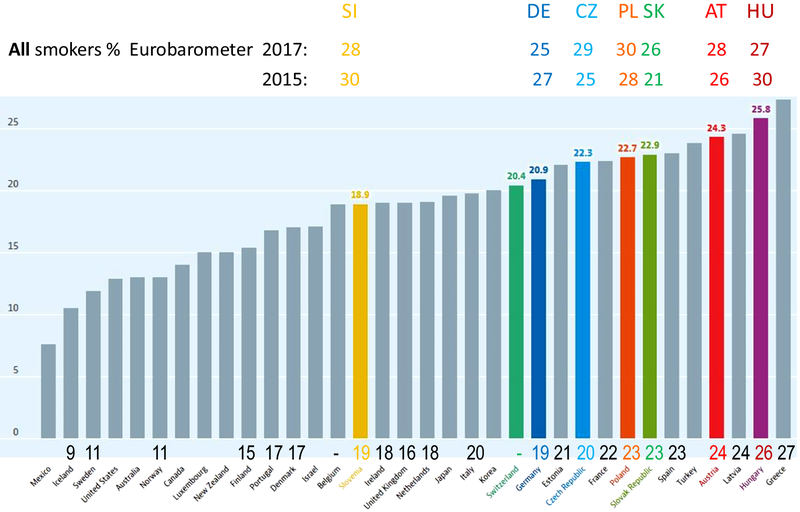 For comparison the smoking rates including occasional smoking are given above the bars for highlighted European Union (EU) members in Central Europe, according to the Eurobarometer survey [8, 9]. Greece, Hungary and Latvia had a high smoking prevalence, but recently showed a large decline. According to the OECD 44 states have reduced smoking since 2000, with the exception of Austria, Slovakia and Indonesia . The fall in smoking rates, however, was much less pronounced in Europe than in Australia and North America. Pioneers like Iceland, Sweden and Norway reached rates like Utah and California, but on average smoking prevalence had been reduced by 2015 to only 26% of the EU population aged ≥15 years, while it reduced to 15% of the US population aged ≥18 years. This large difference cannot be explained by fewer efforts in tobacco dependence treatment, since most EU members provide a national quitline and additional smoking cessation services free of charge. The main reasons for Europe lagging behind North America and Australia include low prices of tobacco and poor smoke-free legislation and enforcement in Eastern and Central Europe . Both the World Bank [11, 12] and the World Health Organisation (WHO) [13, 14] recommended raising tobacco taxes to around 80% of the retail price. 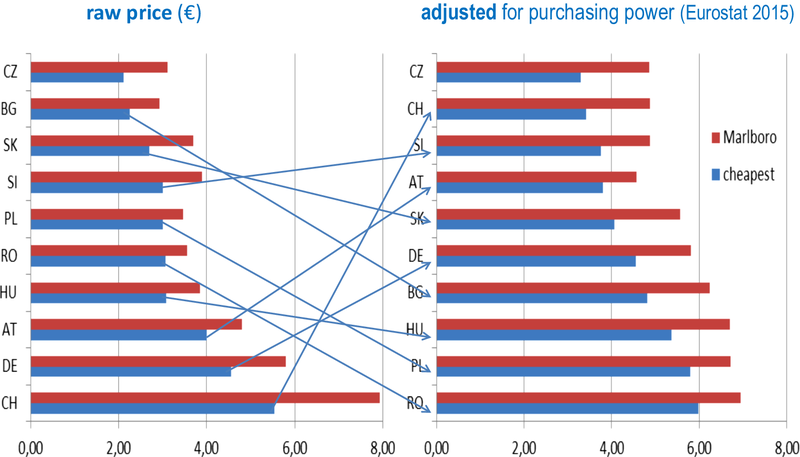 In Europe cigarette consumption decreased by 5%–7% for a 10% increase in the real price . This decrease was most pronounced in adolescents, individuals with low socioeconomic status and individuals with low education that are difficult to reach with health campaigns [14, 15]. Tobacco prices in Europe show a decline from Northwest to Southeast. Compared to the EU average (100%) the tobacco prices reach 223% in Norway, 208% in Ireland, 202% in Iceland and 194% in the United Kingdom, but only 35% in Albania, 40%–41% in Bosnia, Serbia and Kosovo and 51% in Bulgaria . However, affordability is more important than the raw price. Fig. 2 gives the raw prices of 20 cigarettes in Central Europe and prices adjusted for purchasing power, showing the highest affordability of a pack of cigarettes in the Czech Republic, followed by Switzerland, Slovenia and Austria. Countries with a decline in cigarette affordability from 2008 to 2016 are graphed in a recent WHO report on the monitoring of tobacco use and prevention policies . In Europe only Norway, Ireland, Iceland and United Kingdom reached acceptably levels to date. The second most important tobacco control measure is to protect people from tobacco smoke by smoke-free legislation for workplaces and public places and its enforcement [10, 11, 13, 17, 18, 19]. Smoke-free rooms are a prerequisite to denormalizing smoking, so that tobacco smoke is recognized as air pollution, its social acceptance decreases, and it becomes a motivation for smokers to reduce or quit. Also the seduction of adolescents is hindered by smoke-free public rooms (without exceptions for the hospitality industry). Poor compliance with the Framework Convention on Tobacco Control , relatively high affordability and availability of cigarettes and poor protection of unborn, adolescents and other non-smokers were the main reasons why Austria has achieved the lowest score since 2007 on the European Tobacco Control Scale [10, 21, 22, 23]. Against the wish of 70% of the population Austria’s new government cancelled the smoke-free hospitality legislation in 2018 . In Central Europe Austria has a higher smoking prevalence than its neighbors and, with the exception of Germany, all smoking rates for EU members in Central Europe exceeded the EU average . Also, passive smoking in percent of the population aged ≥15 years was above the EU average in the Czech Republic, Poland, the Slovak Republic and Austria, but has decreased considerably in Hungary since the reform of tobacco legislation in 2012 (Table 2). In the Tobacco Control Scale a country can gain up to 30 points for a high tobacco price adjusted for purchasing power, up to 22 points for smoke-free legislation and enforcement, up to 15 points for public information and campaigning and up to 13 points for comprehensive bans on tobacco advertising, promotion and sponsoring. It is insufficient to look at the spending on information on the benefits of non-smoking, if these campaigns are not evaluated, address children only or serve mainly to distribute a photo of the health minister for his reputation as a health campaigner. Hypocritical politicians prefer to talk about “improvement of youth protection”, but still give minors access to tobacco shops and smoking rooms, refuse to ban tobacco advertising and block independent mystery shopping for age control. They know that the electronic age control by vending machines has failed, but they keep them due to business interests. Hungary previously had extremely high smoking rates and lung cancer rates, but shortened cigarette supply by a radical reduction of retail stores and banned access of minors to tobacco shops in 2012. Hungary has no cigarette vending machines and banned any outdoor tobacco advertising . Comprehensive bans on tobacco advertising, promotion and sponsoring are lacking in many European countries and implementation of the EU tobacco product directive is incomplete . Larger picture warnings have been introduced, but to date plain packaging is obligatory only in France, the United Kingdom and Ireland. This removal of trademarks, logos, colors and graphics, apart from the government health warning, and brand names presented in a standardized typeface, was first introduced in Australia. In Norway, Hungary and Slovenia laws were passed to make plain packaging obligatory and similar laws are prepared at present in Romania and other EU countries, so that they will get closer to the maximum of 10 points, which is given in the Tobacco Control Scale for appropriate warnings. Broad population measures such as taxes and smoke-free areas are more effective than individual treatment services. Therefore, only a maximum of 10 points can be achieved in the Tobacco Control Scale for helping smokers to stop smoking and stay abstinent. This requires recording of smoking status in medical notes, brief advice in primary care, incentives for documentation and reimbursement of family doctors for providing advice. Most EU members have national quitlines covering all regions of the country, and many answer the phone at least 30 h a week and record messages outside of these office hours to answer them later. Some provide internet counseling and offer physicians the possibility to recommend a patient by fax, so that they can be called back by the quitline with support in their efforts. Apps for self-help are also in use, especially for younger smokers. A free quitline, combined with a free cessation support network, including services in the most prevalent foreign languages, is the optimal model [13, 14]. Switzerland finances tobacco prevention and cessation (including training of cessation experts) by a levy on the tobacco tax and provides reimbursement for counselling and pharmaceutical aids. High success rates have been reported from group therapy and motivation seminars in the workplace [27, 28, 29]. The European Network on Smoking Prevention has published guidelines for treating tobacco dependence , including behavioral counselling with pharmaceutical support by varenicline, cytisine, bupropion, clonidine, nortryptiline, nicotine replacement or combinations. Electronic cigarettes cannot be recommended, since their content is not controlled in the same way as pharmaceutical products and there are concerns that the tobacco industry uses them as a gateway to nicotine addiction rather than as a cessation aid . No pharmaceutical should be given without counselling. Special recommendations are given for the treatment of smoking risk groups (adolescents, pregnant women, smokers with post-cessation weight gain and patients with respiratory, cardiovascular or psychiatric diseases, cancer and other comorbidities) . Smoking is the major cause of cancer. Any form of tobacco can cause cancer. Oncologists see the benefits of quitting smoking in their patients later than cardiologists, nevertheless they should be aware that their therapy is more successful after smoking cessation [31, 32, 33, 34, 35]. The earlier the patient can be convinced to stop smoking and using nicotine, the better his prognosis. Lung cancer screening needs to be combined with a smoking cessation program. Incidence of cancer (and other diseases caused by tobacco and promoted by nicotine) can only be reduced by tobacco prevention, focusing on young people and including SHS. The most important instrument for tobacco control is the Framework Convention for Tobacco Control . Article 5.3 explains why the battle against the tobacco epidemic cannot be won with but only against the tobacco industry.